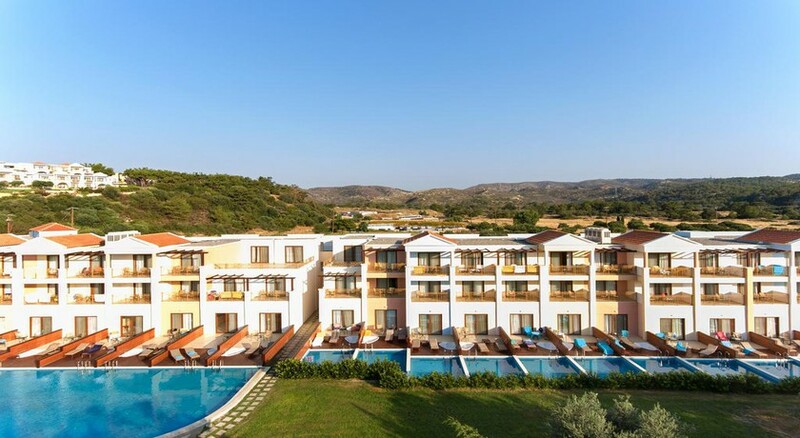 Lindos Imperial Resort & Spa is an upscale plush hotel just a three minutes’ walk from the fascinating Katsouni Beach. 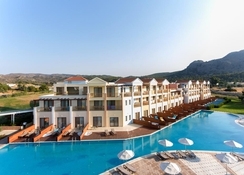 It is at a distance of 13 km from the Lindos Acropolis. Guests can reach the property via air from the Rhodes International Airport which is at a distance of 55 km. 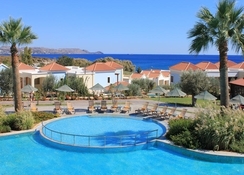 Lindos Imperial Resort & Spa overlooks the Aegean Sea. Some rooms look over the pool and gardens. The resort has multiple bars, sports courts and restaurants for the guests. The hotel features seven swimming pools: four outdoor freshwater swimming pools, one indoor freshwater swimming pool, 2 children’s pools and a waterpark with slides. Guests can enjoy free Wi-Fi here. Lindos Imperial Resort & Spa offers child supervision services. The ever-friendly staff is available 24 x 7 to help the guests with their car rentals, water sports accessories and equipments and other travel information. The resort is located on the Kiotari Beach. Lindos town and archaeological site are at a distance of 8 km from here. The town of Rhodes is 50 km from here. Guests can reach the property from the Rhodes airport at 55 km. The rooms here are quite warm and welcoming. One can find air-conditioning, flat-screen TVs, minifridges and electric coffee makers in the rooms. The TVs are equipped with satellite connectivity. The rooms also provide balconies or terraces with garden or sea views. The suites provide separate living rooms. Some rooms also provide private pools. Guests can access room service 24x7. 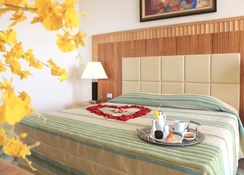 The rooms are elegantly decorated with marble bathrooms and light colors. Lindos Imperial Resort & Spa has 3 restaurants and many bars. Guests can sample Greek, Italian and international cuisines here. The lobby bar at the terrace is a great place for relaxation. Lindos Imperial Resort & Spa has a plush spa offering pampering treatments. A well-maintained garden is the place for taking leisurely walks. The kids can enjoy swimming in the kid’s pool with waterslides. The adults have 3 outdoor pools to soak in. There are many sports courts here for the sports enthusiasts. A gym is available with modern amenities. Guests can kick some ball at the mini football field or play in the boccia field. The property also has a 2 beach-volley courts for the tourists. A sauna in the spa centre will relax you completely. A beauty salon is also present here to cater to your grooming needs.